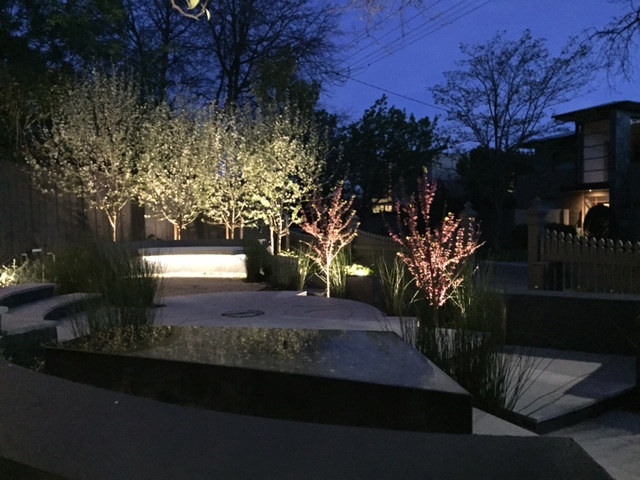 Congratulations on your spectacular design and the team at Transforming Landscapes for making it happen. Can you talk us through the main parts of the design? The main areas of the design comprise of 3 components. The overall garden is a sensory garden. The centre space is the “sense of arrival” as you enter through the front gate & make your way up the curved stairs. This denotes that you have “arrived”. The destination is here. 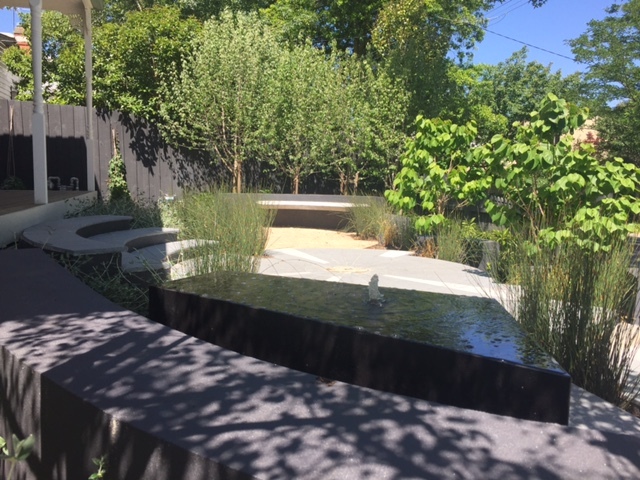 To the left is the 2nd area which I see as the “tranquillity” space with the polished black granite wet edge water feature. I chose polished black granite for the dramatic contrast with the plant material but the beautiful reflective quality it gives. 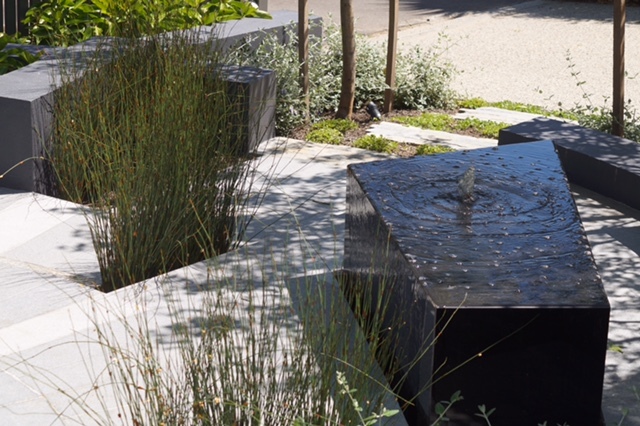 The water feature reflects its surroundings – the sky, plant material & natural & artificial light at night. The wall behind is designed at seating height for you to come close & experience the water, feel it, listen to the sounds. Thirdly the circular Space with the curved concrete cantilevered bench is a contemplative space. The use of Crushed Granite evokes a more relaxed feel & sound underfoot. The location of the bench seat beneath the pleached Snow Pears (Pyrus novalis) provides a vista across to the water feature & mirrored pleached Snow Pears on to the opposing space. This is very much a framed view to stop, reflect & relax. What were your main considerations when designing the project for your client? Considerations for the space from the client was the access from the street & driveway. An interesting outlook from the front windows of the property were paramount. Relatively low maintenance but interesting foliage/flower contrasts. Preferably no lawn as they live close to the local park & oval. Interest at night with lighting & the “sparkle” from the water feature. It’s a sense of arrival for visitors & dealing with level change in an interesting way over a short distance. When designing the landscape, was there a part that was particularly challenging? The most challenging was dealing with the level changes over short distances, but at the same time meeting the brief criteria that the client set. 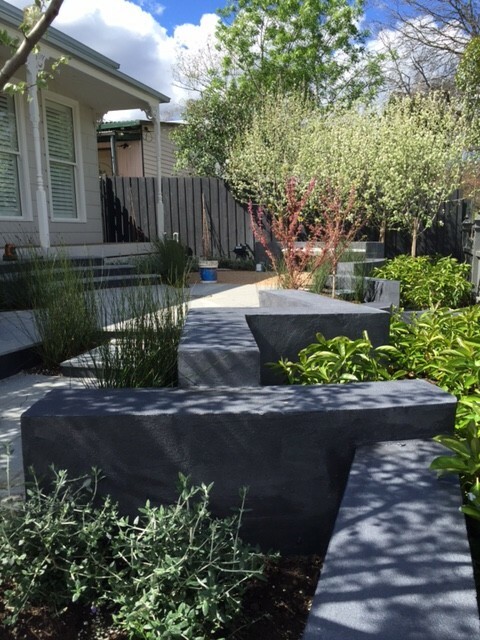 Was it your intention to contrast the Cercis Avondale with the polished concrete and the property so vividly? Or did it only become apparent during the construction process? I was walking through Kilby Nursery on a glorious day with Tanya & saw the Cercis “Avondale”. We had selected the other mass planting species – Teucrium, Viburnum “Emerald Lustre”, Loropetalum “China Pink”. We felt that the vivid pink blossom would contrast dramatically against the polished black water feature & grey tones of the granite. The client & neighbours thought they were stunning. They were the talk of the street!! 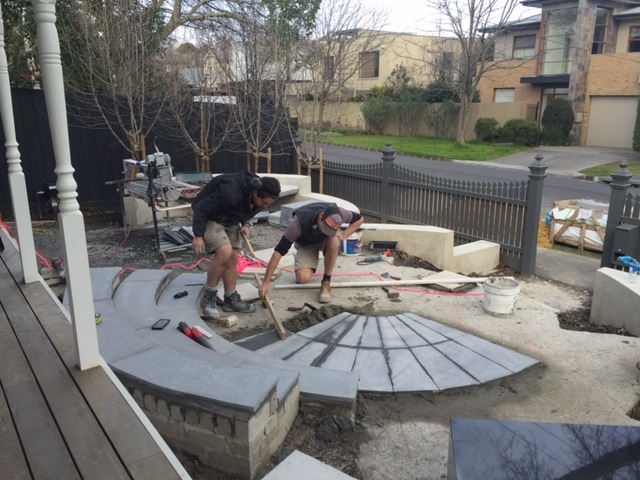 Did you have to adjust your design during the build process due to unexpected occurrences? We didn’t have any changes during the construction process. The Pin Oak (Quercia palustrus) which is a street tree immediately out from this front garden space has extensive root system within the garden. Transforming Landscapes were fantastic at making this work with the intended design. It is apparent once you start setting out the design that any slight change affects other design elements. 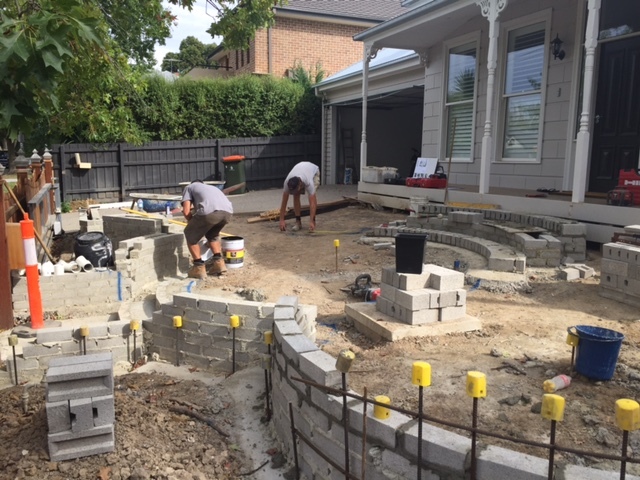 Particularly the layout of the garden walls & radial paving. You can contact Julie by emailing her at julie.e.crowe@gmail.com or on Instagram with @juliecrowedesign.